LiveU (stand 3.B62) is presenting the latest addition to its HEVC product family at IBC2018, completing the transition of all its broadcast-grade units to HEVC and putting professional HEVC encoding within a wider reach. The new LU300 HEVC field unit combines high-quality video performance with extreme bandwidth efficiency in a compact form-factor. At an attractive price-point, the LU300 solution with HEVC at its core is tailored to customers requiring a smaller field unit for high-quality video-on-the-go. LiveU now has a hardware HEVC offering for every product, with the affordable LU300 joining the LU600 high-end backpack and LU610 rackmount 1U encoder in a complete family of hardware-based HEVC solutions. Weighing just over 900 grams (2 lbs) and available in a pouch or camera-mount configuration, the LU300 bonds up to six connections: two LTE-Advanced internal modems, two external modems, WiFi, and LAN. Users can operate in real-time with extreme low latency with the highest quality, even at very low bit rates. This is where the LU300 differs from software solutions where video quality may be sacrificed to keep the latency low or may be switched back to H.264 to save battery life. Unlike software solutions, LiveU’s hardware solutions are encoding in HEVC all the time, providing longer battery time (the LU300 includes a three-hour internal battery). Live & Store functionality enables users to upload high-quality stored copies of the live video immediately after live sessions. 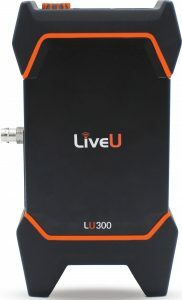 Highly flexible, the LU300 can also serve as a standalone video encoder or be used as a LiveU DataBridge mobile hotspot for general connectivity in the field. With its new design, the LU300 offers an enlarged 2.2” display with improved resolution, dramatic improvement in the visibility under sunlight conditions and a new JOG controller for easier control of the unit. Additional enhancements include a stronger CPU for super-fast file upload. The unit can be locally managed, or remotely managed, via LiveU Central, the unified management platform for LiveU’s field-units. To be demonstrated for the first time at IBC2018 show, the LU300 is scheduled to become commercially available in Q4 2018. LiveU is reinventing live IP video transmission, distribution, and online streaming solutions at the IBC Show in Amsterdam, 13-18 September 13-18.